Hello all, I hope you are enjoying your week so far. Today is a bit of a chatty (AKA I'm about to ramble) post all about moving at your own pace. I have recently been told that I should "have a good job that is leading somewhere and be thinking about marriage because you are already 22 after all". I was also in a conversation with a recently pregnant woman who decided to tell me that I should get pregnant now because "your early 20s is the best time" and that there "is no point trying after you're 30". I think what the woman seemed to forget that I am currently unemployed and do not have a house of my own but because I have reached a certain age that meant I must be planning on getting pregnant in her eyes. It's taken me a while to learn to ignore comments like this and to not let people make me feel like a failure because I have not met the goals other people have made for me. But finally I've come to the conclusion is that people can mind their own damn business. I'm still figuring things out and that is perfectly OK, I'm not a failure. What would be a failure would be rushing into something like a career that I wasn't certain of because I felt I had to meet some stupid goal because of my age. Society puts so much pressure on us to achieve certain goals: good job by your mid 20s, marriage and kids by 30, etc. Sometimes these pressures can really get to us making us feel like we aren't going at "the right speed". There is no such thing as "the right speed", move at your own pace. It's your life and your rules and to hell what anyone else says or thinks. 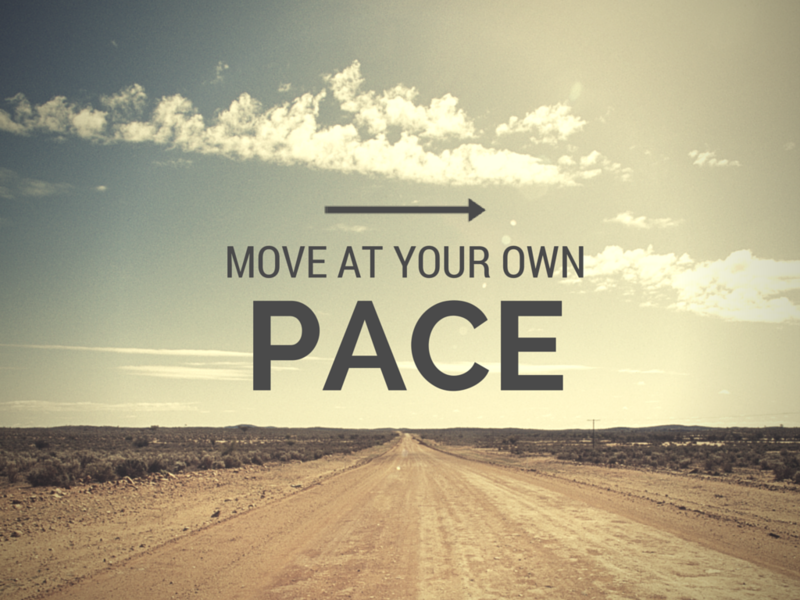 If you move at your own pace you are more likely to enjoy your life and will be happier with the choices you do make. Moving at your own pace means you're living your own life and not living someone else's life for them. Don't feel pressured into something because someone is telling you that you should because you're 20, 25, 30, 35 and so on. Do something because it feels right for you, because it feels like the right time for you. When it comes to careers, love, family, the only way you'll be truly happy is when you move at your own pace, you'll appreciate it all so much more. I hope this post was helpful and enjoyable for you all, sorry to rant a bit. Let me know what you think about moving at your own pace. Ugh poor you that must be so frustrating! I seriously cannot stand it when people judge people who choose not to have children as if there is some law saying that all couples must have kids. Yeah I'm happy just going at my own pace still figuring things out along the way. Aw thank you Kim you're amazing too my gorgeous friend!